Three full-length thrillers in one ebook! This trilogy features Kathryn “Casey” Collins, a US Foreign Service Officer who specializes in analyzing and predicting terrorist acts. Join Casey on a twisting ride through post-Cold War Europe as she’s drawn off her desk job and into action. In 12 Drummers Drumming, the first volume in the series, Casey learns a New York bound flight from England exploded soon after takeoff like a macabre Lockerbie Two. Fearing her lover, Stefan Krajewski, a Polish operative for the Danish Defense Intelligence Service, was on the ill-fated flight, she flies to Europe to learn the truth. 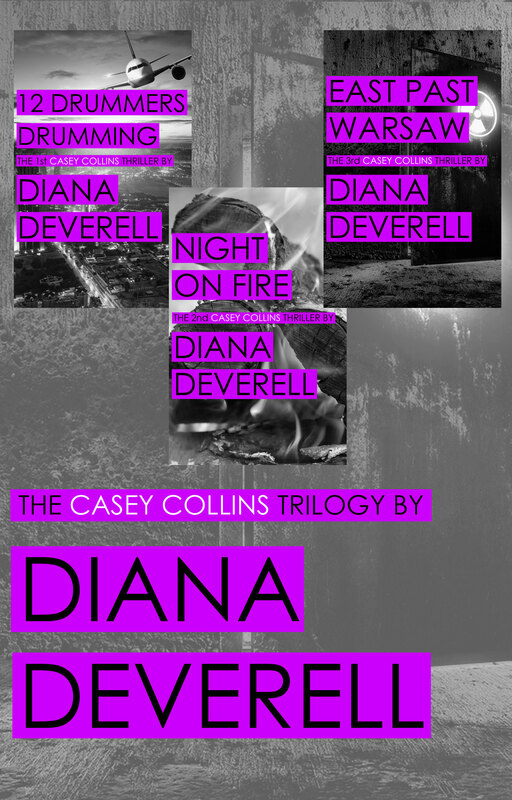 Night on Fire, the second volume, takes Casey to Denmark where she’s tasked to locate and recover missing Stinger missiles offered for sale on the black market. Her adventures climax in the third volume, East Past Warsaw. A crushing series of events force Casey to pursue a missing nuclear physicist and a supply of stolen plutonium.